Millions suffer vision loss and live their lives visually impaired, particularly as they grow older. Eye health is such an important part of our bodies, but it is one that isn’t talked about enough. This article is about how those who are visually impaired could improve eyesight. You might not see where this is going, actually. We’re not talking about a herbal healer here. Or a concoction of natural chemicals in fruits and vegetables that could improve vision. Instead…ring ring! We’re talking about the telephone. 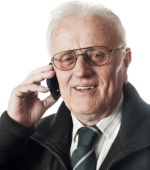 Not a land line of course, but smartphones like the “iPhone” and “Android.” A new study from Loyola University has found that such technologically sophisticated phones could be a huge help to the visually impaired. Researchers surveyed 46 low-vision adults whose best-corrected vision ranged from 20/70 to complete blindness. The study wanted to see if the people with impaired vision were aware of the powers of the smartphone. They discovered that just 15% of patients reported that a vision doctor had recommended a smartphone for the device’s accessibility features. Eleven of the 46 patients (24%) used smartphones. Their average age was 36. Thirty patients (65%) used basic cell phones, and their average age was 67. Five patients (11%) did not own any cell phones. What it showed was that younger visually impaired patients are getting ahead of their doctors. They know of the powers that smartphones hold for those who don’t see the world as clearly as others. The study indicated that vision specialists should be getting out in front on this issue, rather than being behind the curve. There are a variety of accessibility features that smartphones offer to the visually impaired. They include the following. In essence, at risk of sounding like a commercial, smartphones could dramatically improve the quality of life of people with poor vision.